It’s Domestic Violence Awareness Month. 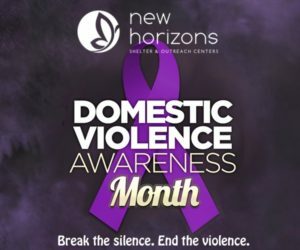 New Horizons is taking the opportunity to educate the public on domestic violence AND give three members of the community the opportunity to win up to $20,000–thanks to the sponsorship and underwriting from Kwik Trip. The first event will take place on Wednesday, October 3rd in two different locations—the two counties (Trempealeau and La Crosse) that New Horizons Shelter & Outreach Centers primarily serve. The message of “Break the Silence – End the Violence” will be the main focus at both gatherings. The first assembly will be a Candlelight Vigil in Whitehall from noon to 2pm at the City Park on Hobson Street. The second will be in La Crosse that same day from 5pm to 7pm in Cameron Park. Both gatherings will feature guests speaking about the effects of domestic violence in the home and surrounding communities. Both events are free and open to the public. There will be refreshments available, music, games, and activities to raise awareness about domestic violence. Additionally, there will be an education & registration booth at both events to become the first of three finalist during the month to have the opportunity to win up to $20,000 through a contest sponsored and underwritten by Kwik Trip. For full rules of the contest, click HERE.